There has been plenty to read about Plug 'n' Parties, and the intention of the city of Amsterdam to support Electric Vehicles (EV) in a BIG way. But we're not alone: France is having a go at it too. Paris is starting a huge Electric Vehicle-sharing programme, similar to the currently running Vélib' a.k.a. Vélo Libre ('Free Bike') programme. Now I'm not quite sure on how the Vélib' project is running in practice, but the concept is great: people pay a small monthly (or daily) fee, which allows them to pick up a bike from designated parkings all over the city. The first 30 minutes are free, and after you pay an increasing rate (from 1 to 4€) for each 30 minutes - to stimulate people to use them for short trips. Us Dutchies had the same bright idea once, in 1965. It was just a tad more idealistic and (sadly) less feasible. They were 'white bikes'; bikes you could not lock and were 'public property', payed for by the government. Then in 1968 the 'witkar' was introduced: same idealistic concept with Electric Vehicles, but it too failed. But hey, it's 2010, and Paris gives it another go! Enter the Autolib', a huge Witkar-like project, the ''world's first" electric sharing programme on such a scale. 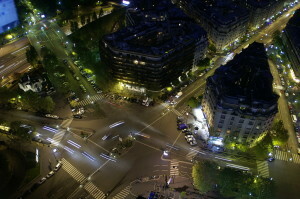 The aim is to get 3.000 EVs on 1.000 designated parking places in Paris and the surroundings. However, the project is still in its infancy: this month the bids for operating the programme were turned in, and by December we'll know what company will be paid by the government of Paris to actually carry out this daunting task. We do know the programme will be very similar to the Vélib'; you pay for a subscription, and then you can pick up EVs for a small fee.